One spring break when the boys were young, we had a “Pancakes around the World” week. Every morning, I made a new kind of pancake for breakfast. It was a huge hit – and one that the kids asked to have repeated a few times as they were growing up. While the kids are now less prone to exciting food gimmicks, they still like a good pancake now and then. Here are my recipes for some of my pancakes around the world. Place a 9×9 square pan or cast iron skillet in the oven with butter in the pan. Allow butter to melt as oven preheats. Meanwhile, whirl eggs in a blender until well light and fluffy. Leaving the blender running, add milk through the lid slowly. Whisk together flour, salt, and nutmeg and add in two to three additions to running blender until combined. When oven is preheated, swirl melted butter all around the bottom of the pan to completely coat. Carefully pour batter in pan on top of butter. Bake until puffy and brown, about 12 minutes. When I was growing up, my favorite topping for Dutch babies was a dusting of powdered sugar and a little lemon juice, but you can also top with fruit compote, warm fruit, or syrup. This is a long-time family favorite. Follow the link above! With a Swedish grandma, this is a family favorite. Really, it’s crepes but no one needs to know. 4 tablespoons of butter, melted – plus extra for cooking. Combine butter, flour, milk, eggs, vanilla, and salt in a blender and process until well combined. In a non-stick, flat-bottomed skilled, melt about 1 teaspoon of butter. 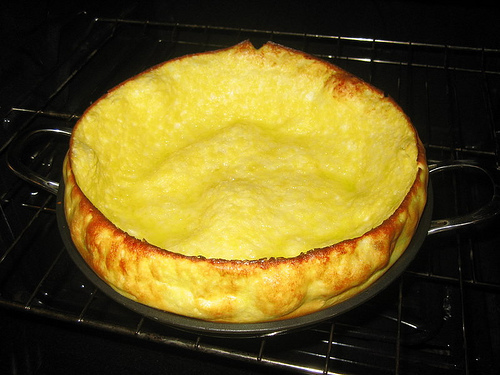 Pour 1/4 cup of batter in pan and whirl around the pan until it forms a very thin layer on the bottom. Cook until the pancake is set. Carefully flip pancake and cook a minute on other side. Roll pancake and place on a plate in the oven to keep warm until the batch is done. Serve filled with a little powdered sugar or jam and top with syrup or fruit. Sure, you can use a mix but nothing beats the flavor of old-fashioned buttermilk pancakes. In a large liquid measure, add milk and buttermilk. Stir to combine. Whisk egg yolk with melted butter, and then whisk into milk mixture. Pour wet ingredients into dry ingredients and whisk together until just combined. Don’t over mix. Heat a griddle and brush lightly with butter. Cook pancakes on both sides until browed and set. Add your own family favorites to the rotation and IHOP won’t have anything on you!